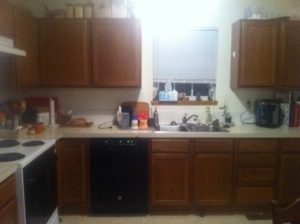 So I got my kitchen clean on today. I stayed in the kitchen for a really long time. 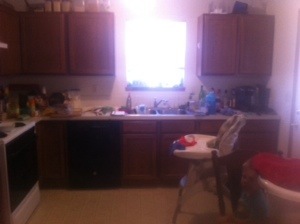 Let me tell you that the kitchen looked a lot worse than the photo below when I started. I emptied the dishwasher twice today. And did the dishes twice today. The bunch of dishes are air drying next to the sink. I didn’t feel like drying them. 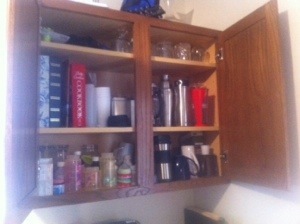 This cabinet is a jumbled mess. Here’s the after. 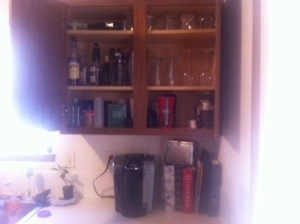 I put all the alcohol in the cabinet. It’s so much more organized now. I put all the medicine in a container on the bottom shelf and I only kept one bottle out just in case we have a rough night. 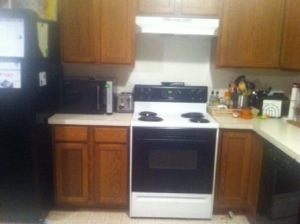 The top of the microwave is a catch all for papers and stuff I don’t know what to do with. And I always forget to wipe out the microwave when I do the dishes. 😦 I need to make a sign on the window so I don’t forget to do it. 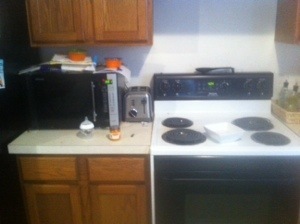 The only thing on top of the microwave now is my car keys.